Posting that chicken chiffon pie really took a lot out of me, but I think I’m in recovery. Now we can move on to better, and yummier, things. Like horseradish cream. I just discovered this easy sauce on Friday – I had gotten a tenderloin out of the freezer for dinner, and was trying to figure out what to cook alongside. I pulled out Suzanne Goin’s Sunday Suppers at Lucques , which is helpfully arranged both by season and by menu, and found a suggestion of roasted beets with horseradish creme fraiche. We bought some enormous beets recently at the farmer’s market, so that was an easy call, and the sauce sounded fantastic. I walked down to the co-op and picked up a container of creme fraiche. I’ve made this myself in the past, but it takes time to culture so this time I took the easy route. And all I had to do was stir in a heaping spoonful of prepared horseradish and some salt and pepper (Goin adds a few other seasonings, but it didn’t seem necessary). 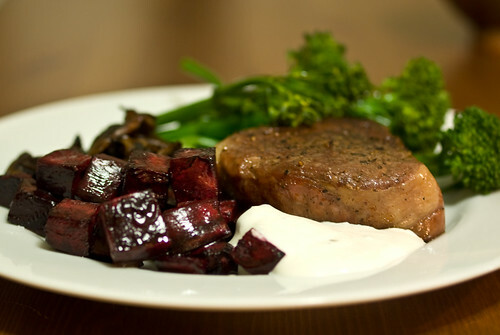 It was SO GOOD with the beets, which we cubed and roasted in olive oil and herbed salt, as well as the steak and the steamed broccolini. And it was good the next morning with latkes, and eaten cold that night stirred into leftover beets. And the tiny bit that’s left is fated to be drizzled over tonight’s beef stew with barley and mushrooms. I’m looking forward to it. Next > The 2011 Food on the Brain Calendar!